Special Olympics announced today that Elena Delle Donne, professional basketball player with the WNBA’s Chicago Sky and 2013 WNBA Rookie of the Year, now joins the Special Olympics family as the movement’s newest addition to the Global Ambassadors. Delle Donne will support Special Olympics’ efforts in promoting acceptance, inclusion, respect and dignity for people with intellectual disabilities and will kick off her involvement with a special assembly at Homewood-Flossmoor Community High School in Flossmoor, Illinois. As part of her role as an Ambassador, Elena will invite Special Olympics athletes to join her at her De11e Donne Skills Academy and will work to promote basketball development within Special Olympics, particularly among girls and promote social inclusion through Unified Sports®. Additionally, she will participate in upcoming NBA All-Star Game activities and take part in key initiatives for Special Olympics including Spread the Word to End the Word Day® on March 5th and the Motor Activities Program (MATP), in which her sister has been an active participant. MATP provides specialized training for athletes in skills that may lead to participation in a traditional Special Olympics event. Today, Delle Donne will join an assembly with hundreds of students from Flossmoor to talk about the importance of activating youth to promote inclusion in schools via Unified Sports® such as basketball. Unified Sports pairs players with intellectual disabilities with players without intellectual disabilities to play together. Students from the school and from around the world will welcome Elena in real time by tweeting her using #WelcomeElena, and will also be able to ask her questions about her role as a Global Ambassador and involvement with Special Olympics. 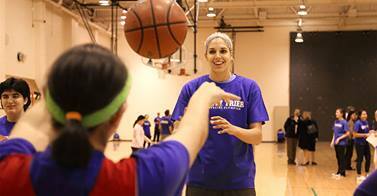 Elena will host a Facebook chat later in the day from her page atElena Delle Donne at 5:00 p.m. EST. Following the assembly, Elena will host a unified basketball clinic with Homewood-Flossmoor High School’s varsity girls’ basketball team and local Special Olympics athletes. Homewood-Flossmoor Community High School is part of Special Olympics Project UNIFY®, an education-based program that uses the sports and education initiatives of Special Olympics to activate youth to promote school communities where all young people are agents of change. Funded by the U.S. Department of Education, the goal of the program is to foster respect, dignity and advocacy for people with intellectual disabilities. Since 2009, more than 35 U.S. state programs have engaged in the mission of Project UNIFY to engage students and schools in a host of core activities like Unified Sports®. Delle Donne joins a prestigious list of Global Ambassadors including Her Serene Highness Princess Charlene of Monaco, Nadia Comaneci, Scott Hamilton, Padraig Harrington, Yuna Kim, Yang Lan, Yang Yang, Yao Ming, Ricardo Montaner, Dikembe Mutombo, Hannah Teter, Apolo Anton Ohno, Michael Phelps, Vanessa Williams and Zhang Ziyi. Special Olympics International board members who have expressed their warmest welcome in a video include: Olympic Gymnastics gold medalists Bart Conner and Nadia Comaneci, figure skating champion Michelle Kwan, Olympic short track champion Yang Yang and Olympic basketball legend Yao Ming. Special Olympics is an international organization that changes lives through the power of sport by encouraging and empowering people with intellectual disabilities, promoting acceptance for all, and fostering communities of understanding and respect worldwide. Founded in 1968 by Eunice Kennedy Shriver, the Special Olympics movement has grown from a few hundred athletes to more than four million athletes in over 170 countries in all regions of the world, providing year-round sports training, athletic competition and other related programs. Special Olympics now take place every day, changing the lives of people with intellectual disabilities all over the world, from community playgrounds and ball fields in every small neighborhood’s backyard to World Games. Special Olympics provides people with intellectual disabilities continuing opportunities to realize their potential, develop physical fitness, demonstrate courage, and experience joy and friendship. 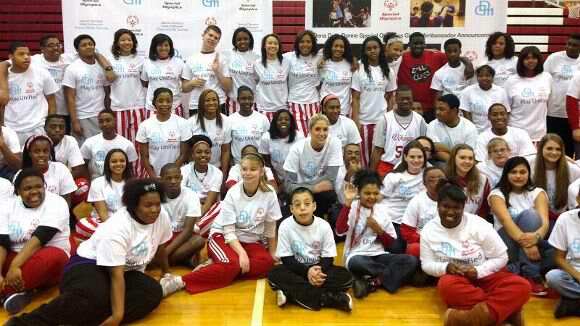 Visit Special Olympics at www.specialolympics.org. Engage with us on: Twitter @specialolympics; fb.com/specialolympics;youtube.com/specialolympicshq, and specialolympicsblog.wordpress.com.